PieSync Help Center - Can I sync Accounts? All Categories ​>​ FAQ ​>​ Can I sync Accounts? Syncing Companies / Organizations / Accounts /... (app-dependent) is not yet available as these are different objects/entities from a syncing perspective. In many cases we do sync the company name field on a contact level, but we can't link with Companies/Organizations/Accounts/... (app-dependent) just yet, neither can we create these. PieSync's next big upcoming feature Relations will make this available fairly soon [ETA in Q3/2019]. First Phase: Enriching contacts by taking information from the contact related object/entity such as the account/company/organization, to enrich the contact information via rules and mappings. We will not be able to create and link contacts to them during this phase yet. Second Phase: Creating different objects/entities such as accounts/companies/organizations. In this phase, we won’t be able to keep e.g. an account in sync with an account just yet. It still needs to originate on the contact level. Third Phase: Syncing contacts with contacts, companies with companies, accounts with accounts etc. while maintaining the relation/link between them. 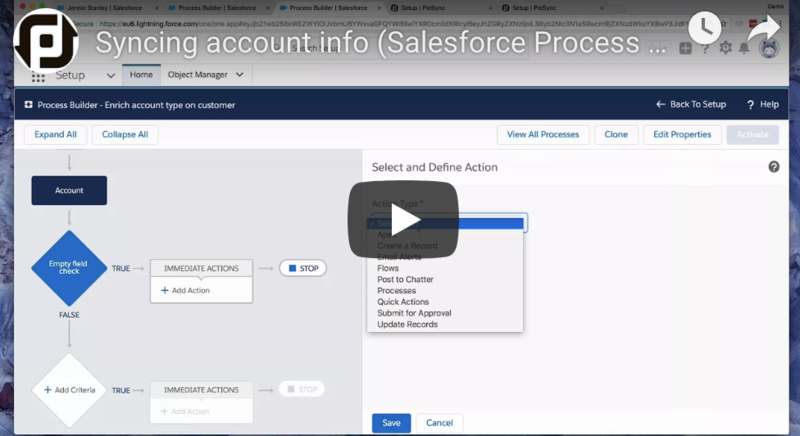 Salesforce & Pipedrive support automation workflows and can translate information from the account or opportunity records to render it available on the contacts object. 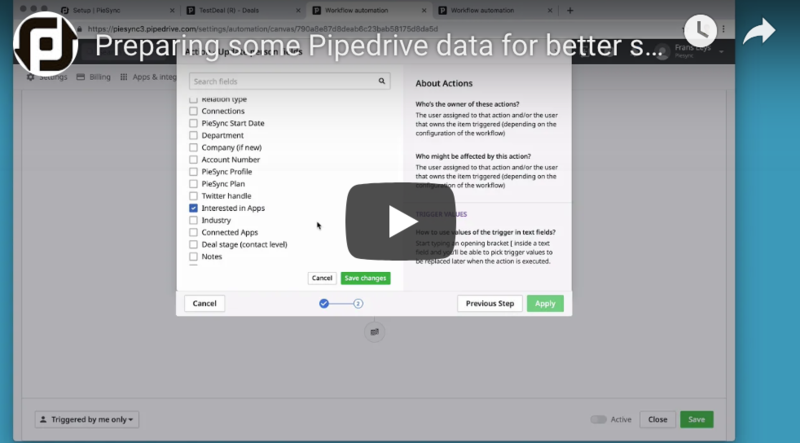 The following videos show how you could set this up using the Salesforce Process Builder or Pipedrive's Workflow Automation respectively. Can I sync objects such as Deals/Tasks/Invoices with PieSync?